Migrating over from Medic primaries, I’m shamelessly stealing an old article format and focusing on another one of my favorite weapons in TF2, a much-maligned mobility tool that has been lumped in with the Rocket Jumper and Sun-on-a-Stick as useless tripe. I’ve long-defended the Sticky Jumper as a perfectly-viable unlock that created a whole new playstyle for aerial Demoman, but thanks to the many, many times Valve has redesigned this weapon, this time we’re going to talk about the things you can’t do with it. At least, not anymore. 1. You can’t plant decoy sticky traps. When the Sticky Jumper first came out, it didn’t have a special model; the gun and its stickies looked exactly like Stock. This meant that you could zone off a hallway or objective by filling it with harmless stickies, and your unknowing enemies would waste ages destroying them before they thought it was safe to progress. 2. You can’t carry the intelligence. This one’s pretty well-known. Valve didn’t like how skilled Sticky Jumper Demomen could blitz through enemy defenses and capture flags in seconds. I’ve talked about how this nerf exemplifies the changes in Valve’s design philosophy between TFC and TF2. The flag-running Sticky Jumper accidentally brought back the Team Fortress Classic metagame where everybody was grabbing flags and throwing them through the air milliseconds before being obliterated by the soldiers and heavies who predicted their arcs faster than Engineer sentries can track. Valve didn’t appreciate this. 3. You can’t plant eight stickies at once. Another well-known nerf, arguably even more famous than the previous one. Many people lamented this unneeded change, our blog included, and it even spawned a holiday memorializing the somber occasion. There were so many uses to having eight stickies, and I’m not just talking about idle frivolities like smashing yourself into the skybox. 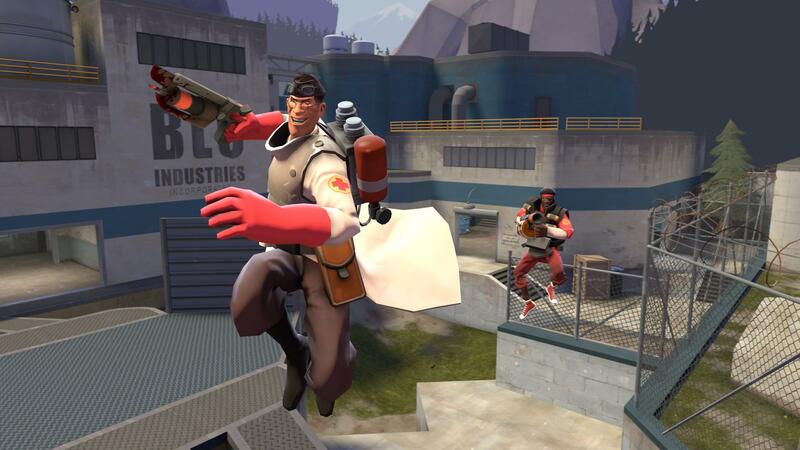 There are plenty of triple-sticky jumps in TF2, which simply require Medic support, and it’s frustrating that you can’t practice them with the weapon Valve supposedly added for practicing sticky jumping. Another trick I liked to use with eight stickies, especially when backcapping or unsure where the enemy was coming from, was to setup a ring of stickies around me so I could escape in any direction at a moment’s notice. 4. You can’t make yourself immune to all explosive damage. 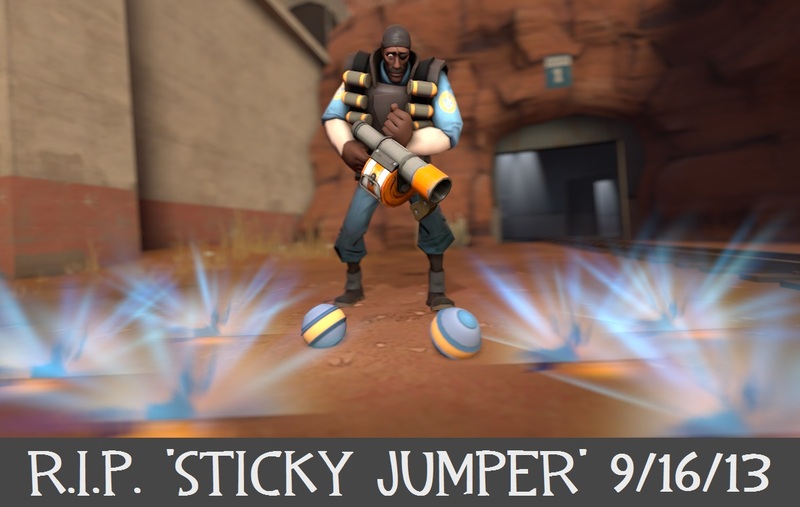 I still enjoy the current Sticky Jumper, despite Valve’s best efforts, but there’s no doubt that the Sticky Jumper’s golden years were in 2011, after Valve removed the -50% health penalty but before they got rid of the total self-damage immunity. The Demoman really was the god of the skies, swooping down on his foe and obliterating them without taking a single point of damage from his grenade launcher, Ullapool caber, or other weapons. The best part? During this time, all the abilities I’ve covered in this list were still active. We will never see a Sticky Jumper like that again, but I’m glad I was there to experience it. Next Next post: What? A Team Fortress Classic update?